She’s an artist. But she doesn’t work with brushes or clay. Her canvas is digital. Morgan Rigsbee is a designer for PIX-US, a Greensboro-based digital modeling and photo-realistic imaging company. She moved to Greensboro from her hometown of Durham to study interior architecture at UNC Greensboro. She loved making things. She joined the Forge makerspace to do wood burning and thought she might eventually go into furniture design. Then she learned to love creating in the digital space by working with the program CamStudio. “That got me really into digital rendering. 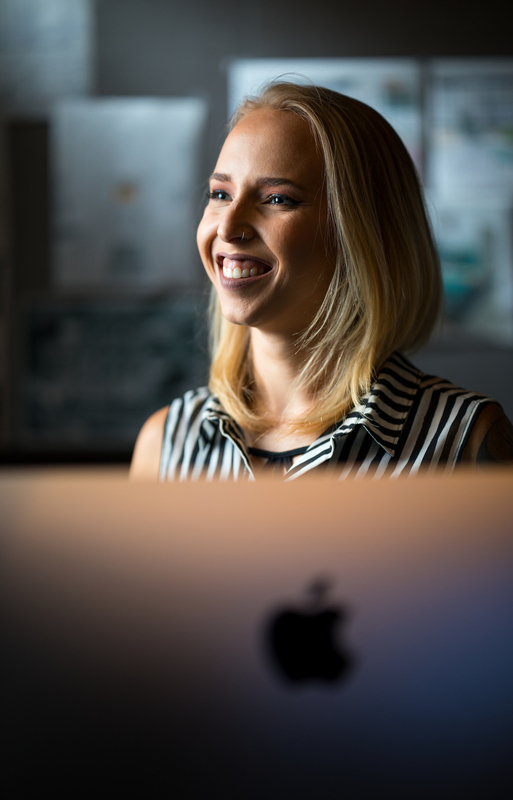 I got really interested in how you could incorporate technology into making and design,” the 2015 UNC Greensboro graduate says. 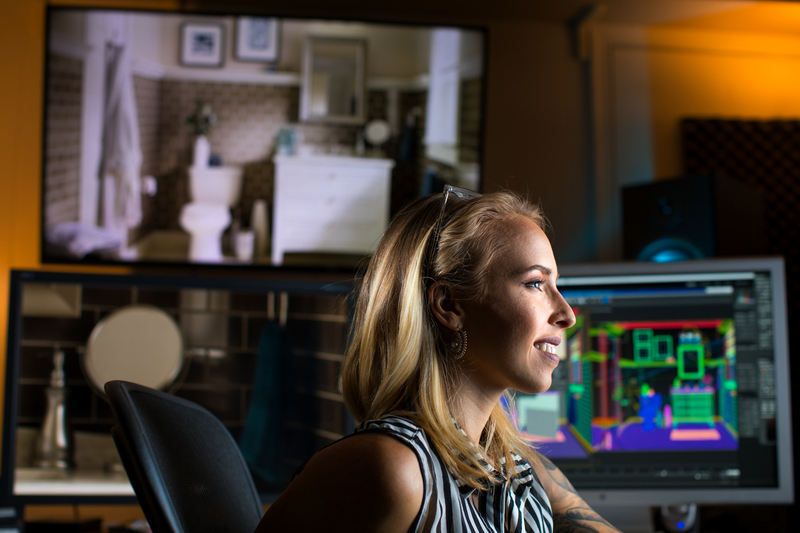 Now that’s what she does every day at PIX-US, helping international companies like the furniture company Steelcase, Mohawk Flooring, or Andersen Windows & Doors show off their products through realistic-looking images she designs digitally. They’ll give her images of the products and other preferences – say paint colors they want to use – and Morgan lets loose her imagination. Add a mid-century inspired sofa. Put down some shiny tile. Throw in the shadows to trick the eye into believing it is real. But also, adding an imperfection here and there. Something slightly off-center. Because real life is never perfect. “We want it to be as photo-realistic and real as possible,” she says. Her final images of gorgeous rooms that expertly feature those products will end up in catalogues or advertisements. One of her designs even made the pages of Dwell magazine. “We make people want it. Our job is to make the product desirable,” she says. Morgan says there are environmental benefits to what she does too. Her design replaces a photo shoot that would use materials and products that would be thrown out afterward. “No trees were harmed in the making of this,” she jokes about her designs.